And it was that on the day that Moses finished erecting the Mishkan, he anointed it, sanctified it, and all its vessels, and the altar and all its vessels, and he anointed them and sanctified them. They brought their offering before the Lord: six covered wagons and twelve oxen, a wagon for each two chieftains, and an ox for each one; they presented them in front of the Mishkan. Take [it] from them, and let them be used in the service of the Tent of Meeting. You shall give them to the Levites, in accordance with each man's work. So Moses took the wagons and the cattle and gave them to the Levites. He gave two wagons and four oxen to the sons of Gershon, according to their work. And he gave four wagons and eight oxen to the sons of Merari, according to their work under the direction of Ithamar the son of Aaron the priest. But to the sons of Kohath he did not give, for incumbent upon them was the work involving the holy [objects], which they were to carry on their shoulders. The chieftains brought [offerings for] the dedication of the altar on the day it was anointed; the chieftains presented their offerings in front of the altar. The Lord said to Moses: One chieftain each day, one chieftain each day, shall present his offering for the dedication of the altar. The one who brought his offering on the first day was Nahshon the son of Amminadab of the tribe of Judah. And his offering was one silver bowl weighing one hundred and thirty [shekels], one silver sprinkling basin [weighing] seventy shekels according to the holy shekel, both filled with fine flour mixed with olive oil for a meal offering. One spoon [weighing] ten [shekels] of gold filled with incense. One young bull, one ram and one lamb in its first year for a burnt offering. One young he goat for a sin offering. And for the peace offering: two oxen, five rams, five he goats, five lambs in their first year; this was the offering of Nahshon the son of Amminadab. On the second day, Nethanel the son of Zu'ar, the chieftain of Issachar brought [his offering]. He brought his offering of one silver bowl weighing one hundred and thirty [shekels], one silver sprinkling basin [weighing] seventy shekels according to the holy shekel, both filled with fine flour mixed with olive oil for a meal offering. And for the peace offering: two oxen, five rams, five he goats, five lambs in their first year; this was the offering of Nethanel the son of Zu'ar. 24On the third day, the chieftain was of the sons of Zebulun, Eliab the son of Helon. 25His offering was one silver bowl weighing one hundred and thirty [shekels], one silver sprinkling basin [weighing] seventy shekels according to the holy shekel, both filled with fine flour mixed with olive oil for a meal offering. 26One spoon [weighing] ten [shekels] of gold filled with incense. 27One young bull, one ram and one lamb in its first year for a burnt offering. 28One young he goat for a sin offering. 29And for the peace offering: two oxen, five rams, five he goats, five lambs in their first year; this was the offering of Eliab the son of Helon. 30On the fourth day, the chieftain was of the sons of Reuben, Elitzur the son of Shedeur. 31His offering was one silver bowl weighing one hundred and thirty [shekels], one silver sprinkling basin [weighing] seventy shekels according to the holy shekel, both filled with fine flour mixed with olive oil for a meal offering. 32One spoon [weighing] ten [shekels] of gold filled with incense. 33One young bull, one ram and one lamb in its first year for a burnt offering. 34One young he goat for a sin offering. 35And for the peace offering: two oxen, five rams, five he goats, five lambs in their first year; this was the offering of Elitzur the son of Shedeur. 36On the fifth day, the chieftain was of the sons of Simeon, Shelumiel the son of Zurishaddai. 37His offering was one silver bowl weighing one hundred and thirty [shekels], one silver sprinkling basin [weighing] seventy shekels according to the holy shekel, both filled with fine flour mixed with olive oil for a meal offering. 38One spoon [weighing] ten [shekels] of gold filled with incense. 39One young bull, one ram and one lamb in its first year for a burnt offering. 40One young he goat for a sin offering. 41And for the peace offering: two oxen, five rams, five he goats, five lambs in their first year; this was the offering of Shelumiel the son of Zurishaddai. 42On the sixth day, the chieftain was of the sons of Gad, Eliasaph the son of De'uel. 43His offering was one silver bowl weighing one hundred and thirty [shekels], one silver sprinkling basin [weighing] seventy shekels according to the holy shekel, both filled with fine flour mixed with olive oil for a meal offering. 44One spoon [weighing] ten [shekels] of gold filled with incense. 45One young bull, one ram and one lamb in its first year for a burnt offering. 46One young he goat for a sin offering. 47And for the peace offering: two oxen, five rams, five he goats, five lambs in their first year; this was the offering of Eliasaph the son of De'uel. 48On the seventh day, the chieftain was of the sons of Ephraim, Elishama the son of Ammihud. 49His offering was one silver bowl weighing one hundred and thirty [shekels], one silver sprinkling basin [weighing] seventy shekels according to the holy shekel, both filled with fine flour mixed with olive oil for a meal offering. 50One spoon [weighing] ten [shekels] of gold filled with incense. 51One young bull, one ram and one lamb in its first year for a burnt offering. 52One young he goat for a sin offering. 54On the eighth day, the chieftain was of the sons of Manasseh, Gamliel the son of Pedazhur. 55His offering was one silver bowl weighing one hundred and thirty [shekels], one silver sprinkling basin [weighing] seventy shekels according to the holy shekel, both filled with fine flour mixed with olive oil for a meal offering. 56One spoon [weighing] ten [shekels] of gold filled with incense. 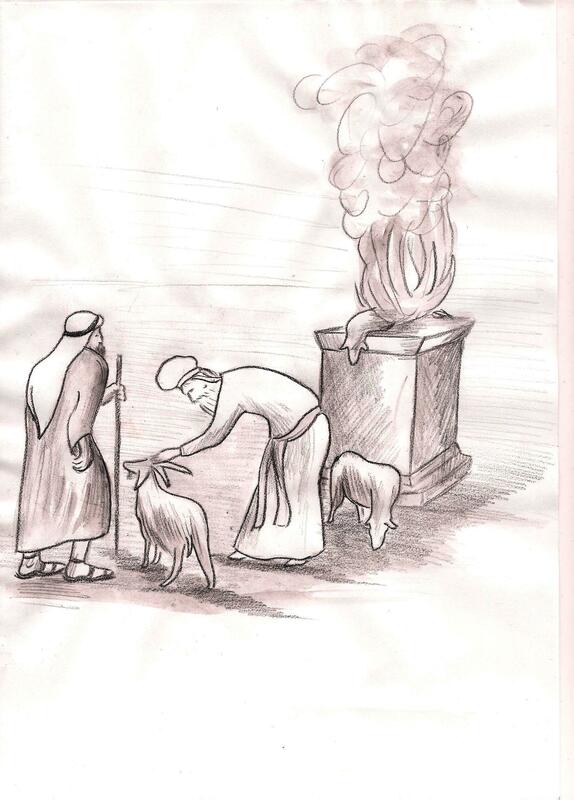 57One young bull, one ram and one lamb in its first year for a burnt offering. 58One young he goat for a sin offering. 59And for the peace offering: two oxen, five rams, five he goats, five lambs in their first year; this was the offering of Gamliel the son of Pedazhur. 60On the ninth day, the chieftain was of the sons of Benjamin, Abidan the son of Gideoni. 61His offering was one silver bowl weighing one hundred and thirty [shekels], one silver sprinkling basin [weighing] seventy shekels according to the holy shekel, both filled with fine flour mixed with olive oil for a meal offering. 62One spoon [weighing] ten [shekels] of gold filled with incense. 63One young bull, one ram and one lamb in its first year for a burnt offering. 64One young he goat for a sin offering. 65And for the peace offering: two oxen, five rams, five he goats, five lambs in their first year; this was the offering of Abidan the son of Gideoni. 66On the tenth day, the chieftain was of the sons of Dan, Ahiezer the son of Ammishaddai. 67His offering was one silver bowl weighing one hundred and thirty [shekels], one silver sprinkling basin [weighing] seventy shekels according to the holy shekel, both filled with fine flour mixed with olive oil for a meal offering. 68One spoon [weighing] ten [shekels] of gold filled with incense. 69One young bull, one ram and one lamb in its first year for a burnt offering. 70One young he goat for a sin offering. 71And for the peace offering: two oxen, five rams, five he goats, five lambs in their first year; this was the offering of Ahiezer the son of Ammishaddai. 72On the eleventh day, the chieftain was of the sons of Asher, Pag'iel the son of Ochran. 73His offering was one silver bowl weighing one hundred and thirty [shekels], one silver sprinkling basin [weighing] seventy shekels according to the holy shekel, both filled with fine flour mixed with olive oil for a meal offering. 74One spoon [weighing] ten [shekels] of gold filled with incense. 75One young bull, one ram and one lamb in its first year for a burnt offering. 76One young he goat for a sin offering. 77And for the peace offering: two oxen, five rams, five he goats, five lambs in their first year; this was the offering of Pag'iel the son of Ochran. 78On the twelfth day, the chieftain was of the sons of Naphtali, Ahira the son of Enan. 79His offering was one silver bowl weighing one hundred and thirty [shekels], one silver sprinkling basin [weighing] seventy shekels according to the holy shekel, both filled with fine flour mixed with olive oil for a meal offering. 80One spoon [weighing] ten [shekels] of gold filled with incense. 81One young bull, one ram and one lamb in its first year for a burnt offering. 82One young he goat for a sin offering. 83And for the peace offering: two oxen, five rams, five he goats, five lambs in their first year; this was the offering of Ahira the son of Enan. 84This was the dedication offering of the altar presented by the chieftains on the day it was anointed; there were twelve silver bowls, twelve silver basins and twelve gold spoons. 85The weight of each silver bowl was one hundred and thirty [shekels], and that of each basin was seventy [shekels]; all the silver of the vessels weighed in total two thousand four hundred [shekels] according to the holy shekel. 86Twelve gold spoons filled with incense; each spoon weighing ten [shekels] according to the holy shekel; all the gold spoons totaled one hundred and twenty shekels. 87The total of the cattle for the burnt offerings was twelve bulls, twelve rams, and twelve lambs in their first year with their meal offerings. And [there were] twelve young he goats for sin offerings. 88The total of cattle for the peace offerings was twenty four oxen, sixty rams, sixty he goats, and sixty lambs in their first year. This was the dedication offering for the altar, after it was anointed. 89When Moses would come into the Tent of Meeting to speak with Him, he would hear the voice speaking to him from the two cherubim above the covering which was over the Ark of Testimony, and He spoke to him.